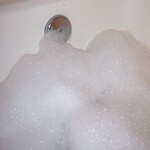 Want The Bubbliest Bubble Bath Ever? Believe it or not I’m not the member of the household who likes to take baths! I mean, I used to be. But lately, I’ve switched to showers cuz they’re quicker — no time for baths anymore. Jim, on the other hand, takes a long, hot bath every week or so! Mostly because of his aching muscles after softball or a hard day at work. 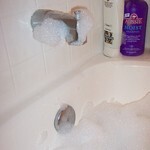 3-in-1 is a huge 32oz bottle of bubble bath / shower gel / shampoo that only cost me $3.99 from Target! "Creatively blended with vitamins, softening ingredients and a wonderfully delicious scent to help you look and feel marvelous." I’m thinking this is the generic version of the high-priced Philosophy 3-in-1 bubble bath (which sells for $16 at half the size… 16oz! ), because I tried to find something out about the manufacturer — Delicious Brands LLC out of Dallas, Texas — but there was nothing to be found. No matter. I’m thrilled that I happened upon this great bargain. It is the best bubble bath I have ever used!!! It only takes a tiny bit. With just the smallest amount (about a Tablespoon), I got a huge tub of bubbles… and they lasted! Since it’s so concentrated and requires so little to actually make a tub-full of bubbles, this 32oz bottle will last us forever! Great, rejuvenating, fresh scent. It’s been a few hours since I used it, and I’m still smelling fresh and limey now. And, the bathroom still smells like one big ‘ol Margarita! It’s an uplifting sort of scent. Hmmmm… I wonder what aromatherapy properties come from limes?! Perfect for frugal shoppers. Though I won’t use it for anything other than the bubble bath feature, others might enjoy using it for its stated "shower gel" and "shampoo" qualities. The chuckle factor. On the bottle it says: "It’s a big, fat LIME in a big, fat bottle. Wall-to-wall LIME. A gigantic, storewide LIME. It’s the biggest LIME to ever hit Hollywood. A LIME of historic proportions. An all-star LIME extravaganza. The LIME of the century. Standing room only LIME. Sea-to-shining-sea LIME. A LIME to end all LIMES. One LIME to rule them all." 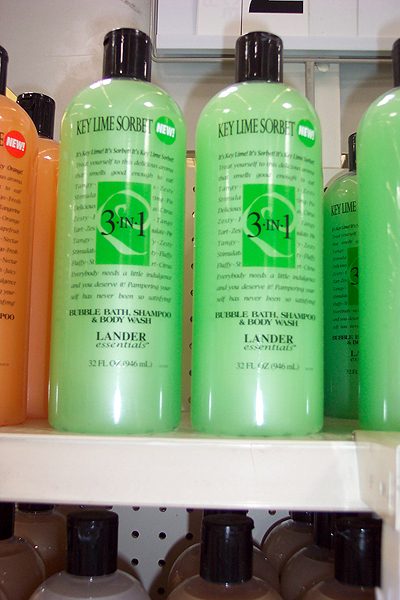 It’s a 3-in-1 bubble bath/shampoo/body wash by Lander Essentials out of New York. As you can see from my photo, they’ve changed the look of their bottles, and the 3-in-1 products must be new for them — they aren’t even listed on their site yet. Walmart was selling 32oz bottles in similar WILD & TASTY scents for about $3. 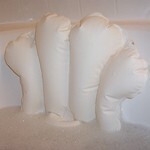 Now you can also find Lander Essentials 3-in-1 Bubble Bath on Amazon.